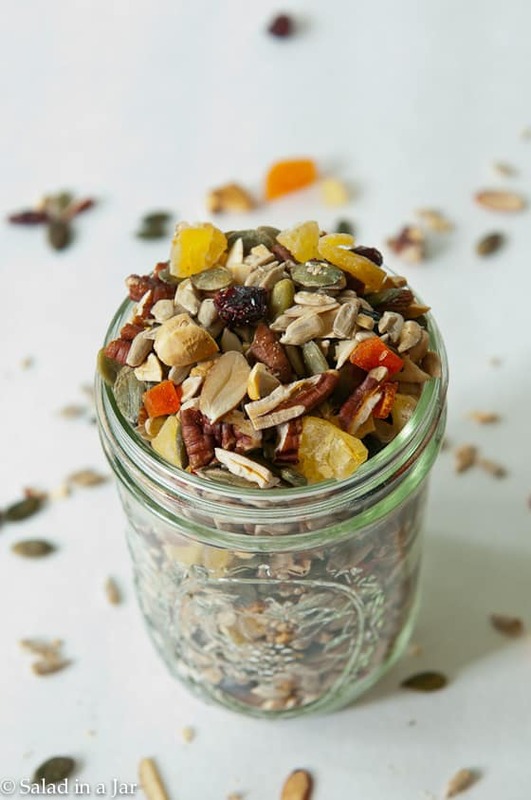 Homemade Fruit and Nut Trail Mix is a snack mixture of seeds and dried fruits you can customize to your own preferences. Makes a healthy topping for a salad or snack No added sugar. It was the Thanksgiving of a lifetime. Our whole family flew from Texas to NYC to celebrate with my youngest son and family who are living there temporarily for three years. Brett and Amanda only live half a block from the parade route, so watching the Macy’s Thanksgiving parade in person instead of on the flat screen was at the top of our to-do list Thursday morning. Watching the parade in frigid temperatures gave us a hearty appetite for a Thanksgiving dinner prepared in the tiniest of kitchens. It didn’t matter. The food was plentiful and scrumptious. After dinner, we observed a Rhodes tradition and watched the Cowboys on TV while the kids kept busy with projects, toys, and enjoying each other. It was the perfect Thanksgiving….except the Cowboys lost. Oh, well. On Friday we joined a Food Tour in Greenwich Village.The first stop was Bleeker Street Pizza, featuring huge pieces of Tuscan-style pizza. That means the cheese is layered beneath the sauce on the pizza which keeps the crust from getting soggy, according to our guide. It’s a good thing because they serve huge slices (see picture below). After pizza, we stopped at an Italian grocery store for Fried Rice Balls. After a bite or two, I decided they were too rich for me, so I offered it to my family. They didn’t want it, but another 20-something kid on the tour with us said he would eat it. I was shocked that a total stranger wanted my rice ball after I had already taken a couple of bites, eating it like an ice cream bar, but he seemed OK with it. Guess he was starving! 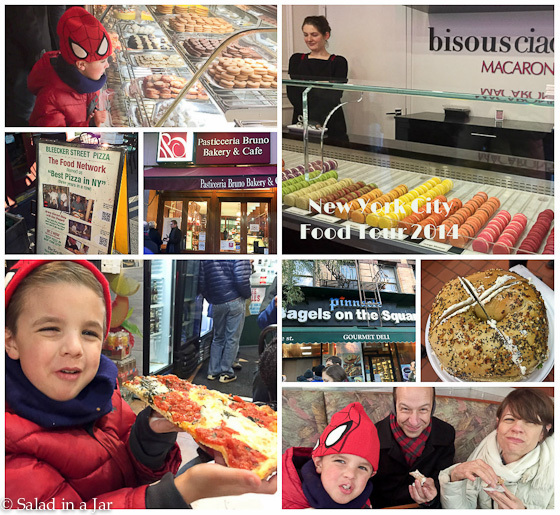 Other tour stops included a bagel shop where the bagels were illegally large, a coffee bean shop with the most heavenly smell ever, a macaron shop (my favorite) and a bakery famous for their cannolis. Now I know why. Their cannolis were fresher and tastier than any we found in Italy. After all those decadent treats, I am back to my routine of eating salad every day for lunch. One of my favorite salad toppings is this custom-made trail mix. No oil or sugar in any form is added because the fruit gives all the sweetness anybody could want and roasting the nuts brings out the flavorful oils. Don’t mix in the fruit until close to the end of the baking time. The nuts are all raw and need to roast first. Adding the dried fruit in the last 10 minutes will not only soften it but also give it a slightly crunchy and chewy crust. If you cook the fruit too long, it can morph to tooth-cracking hard as it cools. Not a good idea, unless you like to visit your dentist between cleanings. Not only do I crave this trail mix on my salad (served with a combination of Balsamic Fig dressing from Whole Foods and Low-Calorie Poppy Seed Dressing from Kroger), it is a frequent travel companion. It can nearly always be found in my carry-on. Sometimes, even in my glove compartment. 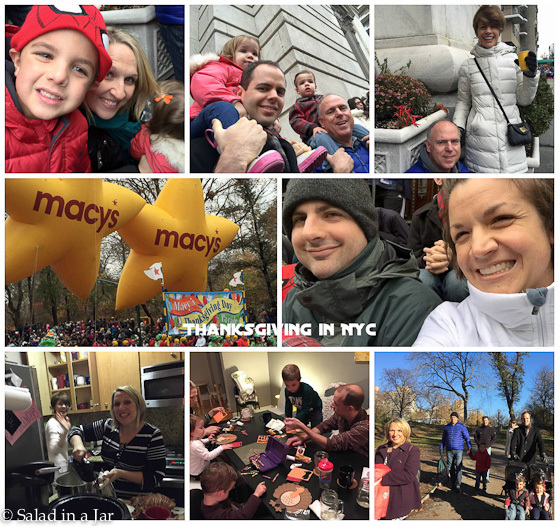 Thank you to Susie, my daughter-in-law, for sharing her NYC pictures for this post. I was too busy jamming my gloved-but-still-cold hands into my coat pockets to take pictures myself. Thankfully, she enjoys documenting all our family memories. Tailor this recipe to your own tastes. More or fewer nuts. Vary the fruit. You're the boss. Pour all seeds and nuts onto a cookie sheet. Stir and distribute evenly. Bake at 300 for 20 minutes. Stir and bake another 20 minutes. Nuts should be just starting to turn brown. Add fruit that you have chopped, if necessary, to match the size of your nuts and stir again. Bake an additional 10 minutes. Allow to cool before storing in plastic bags or Mason jars. Your trip to NYC looked like a lot of fun. How nice to experience the parade in person with family! Trail mix looks great! I love the memories with family, and food! I worked for Macy’s for 25 years, and we had a mini version of this parade in Seattle that we volunteered in almost every year. So much fun with the kids, and extended family- – and that’s what its all about! Happy Holidays, Merry Christmas and all that, Paula! Wow! 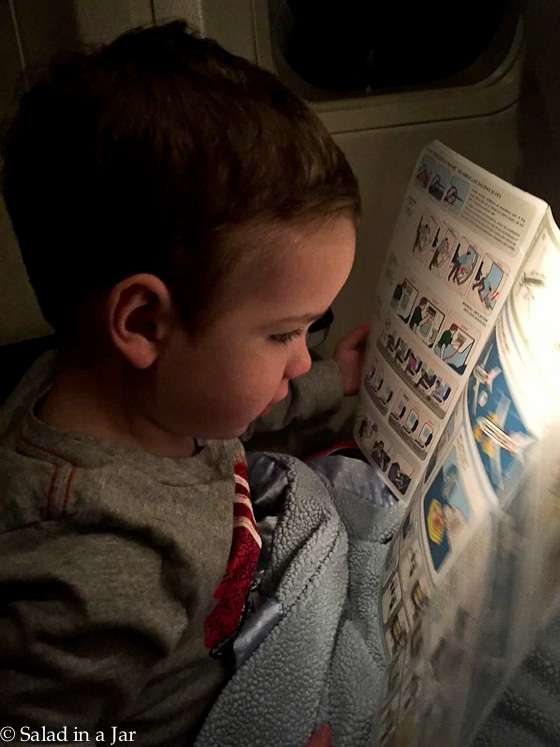 Love the recipe and the summary of your family trip! You all have special places in our hearts! This sounds like a wonderful trip! I’m glad that you were able to enjoy such a perfect holiday. Thanks for the trail mix recipe. I love this stuff on a salad as well! Great post summing up our once in a lifetime trip! It was a blast! This “paleo granola” is almost identical to one that I make, except I also add flaxseeds, 1/8 cup of honey or maple syrup, a dash of salt and vanilla and almond extracts. I sprinkle it over my Salad-In-A-Jar plain Greek yogurt with berries for a healthy breakfast! Your version sounds wonderful. I must try! What a fun (and delicious) holiday with your family! I’ve only ever seen the Macy’s parade on TV- I bet it’s amazing up close in person!